As soon as the CAA Garlic Press gets underway, all the remaining 'thick' ice will head south to oblivion. Then all that will remain is a mush of barely-one-year-old ice filling the basin. The risk of that melting out in anything like an above average melt season seems acute. The atmospheric circulation arising from this year's melt season (ever more open water) re heat transport from equator to the Arctic will be very interesting to watch. Are there any signs of the Ridiculously Resilient Ridge or its relations restoring itself? +PDO has mixed things up in the Pacific. No news about RRR yet. FYI, with it's high salt content will melt at a lower temperatures than the much fresher MYI. Will a preponderance of FYI act to lower atmospheric temperatures, and if so could this be one of the causes of the "rebound years" that seem so often to follow years with very little ice retention? El Niño is brewing. With El Niño and the positive PDO the RRR is history. This winter, instead of the RRR we saw very strong blocking near the dateline. Blocking highs went up over Alaska and retrograded to Siberia over a week or two. The blocks in both the far north Atlantic and far north Pacific brought exceptional heat to the Arctic and heavy rains to California. The positive phase of the PDO does not favor the strong ridge off of the Pacific northwest. SST anomalies and wind vector anomalies continue to indicate the presence of the nega-blob, the inverse of the original blob. The overlay with the classic blob is a little eerie in its symmetry. I don't see the same obverse elsewhere, but I have no meteorological training, so I would rely on FishOutOfWater. I have no idea whether the huge patch of cold water is cause or effect, but it's had plenty of effect here in California through the winter, dragging storms far enough south to give us some pretty good lashings. Hmmm. Well since the blob caused a blocking high, it doesn't seem unreasonable to surmise that the inverse blob might spawn all kinds of eastbound mayhem. CryoSat-2 derived Sea Ice Thickness for March 2017 is now available so it is possible to compare them with the PIOMAS model output. As before, PIOMAS daily gridded data compared to CPOM 2 day 1 km Sea ice Thickness. Difference is calculated as PIOMAS minus CPOM. Also as before, PIOMAS monthly gridded data compared to AWI Cryosat-2 Sea Ice Thickness. Difference is calculated as PIOMAS minus AWI. Again, it seems PIOMAS places the thick blob away north of Greenland, while the actual very thick ice is not there but closer to the shore, as Hycom also shows. What does that say about PIOMAS volume accuracy this year? I am quite concerned. Again, it seems PIOMAS places the thick blob away northbl of Greenland, while the actual very thick ice is not there but closer to the shore, as Hycom also shows. I've been told that they're looking into this. Is that compared to 2016? Compared to the mean of all previous years since 2011. You have to click on the image to start the animation. By the way, Spring means here 1st March to 15th April. CryoSat-2 derived Near Real Time Sea Ice Thickness for April is now available so it is possible to compare them with the PIOMAS model output. Things have changed fast in the last few days of April, see next post. Do to a stupid error on my part the original images were inaccurate / misleading and have been replaced. My apologises for the error. Also as before, PIOMAS monthly gridded data compared to AWI Cryosat-2 Near Real Time Sea Ice Thickness. Is it just a color choice effect, or is there different data being used for the Cryosat plot and the Cryosat vs. PIOMAS plot? The satellite pass pattern is so much more obvious in the PIOMAS-Cryosat plot that it makes me wonder if there's some sort of smoothing step thats been omitted. No, do to a stupid error on my part there is an error in the calculation of the data for the PIOMAS plot which carries over to the CryoSat v PIOMAS plot, for which I apologise. The corrected plots will be posted as soon as they are finished. The original graphics have been replaced. AWI only report their CryoSat-2 derived Sea Ice Thickness from October to April, but CPOM carried on reporting their data until 15 May 2017. As there is no comparison with the AWI 25km data, I have used a 10km EASE-2 grid, as it better illustratres the sparceness of the CryoSat-2 data. For those who like to make the comparison, here is PIOMAS for the end of May, using the DMI and HYCOM CICE palettes. Thanks a lot for these images, Michael. And for sharing all that data and info. I made this comparison ACNFS vs PIOMAS. The nice people at the Alfred Wegener Institute (AWI) have released their "final" CryoSat-2 derived Sea Ice Thickness data for 2017. So for completeness here is a comparison with the PIOMAS monthly gridded thickness data. The AWI CryoSat-2 data is provided on the EASE-2 25km grid, while the PIOMAS model uses an orthogonal curvilinear grid. Each 25km grid cell can contain elements of up to six PIOMAS grid cells, to overcome this the comparison is made on an EASE-2 0.5km grid, and the results are reported on an EASE-2 10km grid. The PIOMAS grid is rendered on the 0.5km grid using polygons to approximate the curvilinear grid. This results in a maximum error of around 1km at the centre of the polygon faces. The result of this error is that each grid cell loses a small area to the grid cell in the row below and gains slightly less area from the grid cell in the row above. There is a similar error at the grid cell corners because the latitude & longitude co-ordinates for the PIOMAS grid are only provided to an accuracy of two decimal places. Close to the pole on the WGS84 spheroid this is only accurate to around 0.558km, and the error increases as you move south. The alternative is to use a nearest neighbour approach which is less accurate because it displaces the corners of the PIOMAS grid cells. The CryoSat-2 satellite does not provide complete coverage of the whole Arctic in one calendar month. Also the CryoSat-2 Synthetic Aperture Radar has a narrow footprint and there is no guarantee that there will be 100% coverage within a 25km grid cell that reports Sea Ice Thickness in a particular calendar month. To allow for this incomplete coverage, and because each 25km grid cell can contain elements of several PIOMAS grid cells, a Monthly Satellite Coverage Mask was used to ensure that a comparison was only made where CryoSat-2 measurements were actually available. The Monthly Satellite Coverage Masks were derived from the CPOM 2-day, 1km Sea Ice Thickness product. The Difference is calculated by subtracting AWI from PIOMAS. NOTE: In making this comparison I am not comparing like with like. The PIOMAS model reports Effective Sea Ice Thickness, while AWI report the weighted average of the CryoSat-2 data points in a 25km grid cell. Do you perchance have the maps colored in terms of percent differences, ie (piomas - awi)/piomas and (piomas - awi)/awi? It seems to me (taking awi as experimentally observed) that piomas thickness errors can be colossal. For example, the artifactual blob near the pole that we've been discussing for months is off by over 2.5 m in January. If the ice were actually 1 m thick with piomas reporting 3.5, then (piomas - awi)/awi = 250%. Overall, this would translate to a very substantial absolute uncertainty in volume (though not necessarily in piomas vs piomas month to month or even year to year change). The invidious comparison I have in mind is the volume of ice sitting over Greenland as measured by GRACE, which is vastly more certain. The visualization below rescales the four months to forum 700 pxl width in nsidc 'greenland down' orientation. It's noteworthy that the significant differences, both ±, remain fairly consistent in location (after adjusting for ice periphery) but moderate in degree as spring progresses. Since cryosat error does not have this locational bias, this consistency suggests that it is piomas that is off the mark. Could you possibly elaborate on what 'effective ice thickness' for piomas means in terms of the model making experimentally testable predictions? That is, suppose we had an unlimited budget for a daily helicopter-borne em induction + altimeter flying a dense grid over a particular piomas cell plus a ground-crew transect of ice cores (like we had this year north of Alert). Those numbers are apples. But it's not clear what piomas is putting on the table: are 'effective ice thickness' numbers validatable or refutable by measurement or instead some sort of abstract (non-physical) construct? Did AWI (or anyone else) make maps yet of the original (as opposed to the difference with PIOMAS) thickness detected by Icesat? Here is an overlay of Michael's difference map with Wipneus' map of PIOMAS thickness, both from April. Short answer, no. I would need to do rather a lot of work to come up with those numbers. The PIOMAS model outputs the distribution of sea ice in a grid cell in terms of the proportion of that ice in 12 thickenss bands. Effective ice thickness is simply the thickness that would result from spreading the ice evenly across the whole grid cell. So wherever you look within the grid cell the ice would be unbroken and of equal thickness. In terms of the thickness of the ice at a particular point in the grid cell, the thickness distribution can be read as a probablity distribution, which will give you the probability of the ice at that point in the grid cell lying in a particular thickness band. It is worth remembering that CryoSat-2 derived sea ice thickness is still experimental, and that there are still uncertainties with regard to many aspects of the process. Also, CryoSat-2 provides a very sparse dataset, and that there is wide temporal spread within these AWI data. It will be interesting to see how CryoSat-2 and PIOMAS compare with Icebridge when the QuickLook data is released. that at least w.r.t. Cryosat2 that PIOMAS overestimates thickness of the thinner ice on the boundaries of the Arctic basin, and possibly underestimates ice in the CAB ? There are two sources for CryoSat-2 derived Sea Ice Thickness. The Alfred Wegener Institute (AWI), and the Centre for Polar Observation and Modelling (CPOM). I have not seen any comparison between these two products, so here is a comparison of the AWI final product and the CPOM 2 day, 1km NRT product for January to April 2017. There is no great difference between the NRT and final AWI products, so this seems a reasonable comparison. For purposes of comparison, CPOM 2 day data was regridded onto the 25km EASE-2 grid used by AWI to create a monthly plot, and then a simple comparison of the two monthly plots was made. The difference is calculated by subtracting the AWI value from the CPOM value. Thank you again Michael. These are a great help. So there do seem to be some systematic differences between AWI and CPOM; however, they are relatively low in magnitude, less than half a metre one way or the other except in certain small regions (immediately adjacent to Greenland and the CAA). Nevertheless, if I am reading these correctly, CPOM agrees with PIOMAS (a bit) more closely than AWI does? I have previously posted monthly comparisons of PIOMAS Sea Ice Thickness and CPOM CryoSat-2 derived Sea Ice Thickness. For convenience I am reposting them here reworked with the new colour bar. The comparison is between PIOMAS hiday daily gridded Effective Sea Ice Thickness and the CPOM 2 day, 1 km NRT product. The difference is calculated by subtracting the AWI value from the PIOMAS value. This still suggests that PIOMAS overestimates ice in the outer areas of the Basin w.r.t. Cryosat2. Result : Observations suggest that PIOMAS underestimates thickness of ice in the boundary of the Arctic Basin, and possibly overestimates ice thickness in the CAB. Before making any firm judgements it is perhaps worth considering how reliable the CryoSat-2 derived Sea Ice Thickness is likely to be. The SIRAL (Synthetic Aperture Interferometric Radar Altimeter) instrument on CryoSat-2 has a footprint of approximately 0.3 km along track by 1.5 km across track and requires 369 days to provide global coverage. So it would require well over 1000 "footprints" to cover a 25km grid cell. In his original study, Laxon used a 0.4 degree latitude by 4 degree longitude grid, and required a minimum of 100 measurements in each cell. The 25km EASE-2 grid used by AWI is somewhat smaller than the grid used by Laxon, but the 100 measurement threshold would seem to be reasonable. AWI provide data for the total number of valid sea-ice thickness data points inside each 25km grid cell, which indicate that around 49% of grid cells reporting sea ice fall below this threshold. This in itself does not invalidate those data, but as the random uncertainties of the individual measurements decreases with the square root of the data points inside each grid cell, it is worth considering. Ricker, R., Hendricks, S., Helm, V., Skourup, H., and Davidson, M.: Sensitivity of CryoSat-2 Arctic sea-ice freeboard and thickness on radar-waveform interpretation, The Cryosphere, 8, 1607-1622, https://doi.org/10.5194/tc-8-1607-2014, 2014. Laxon S. W., K. A. Giles, A. L. Ridout, D. J. Wingham, R. Willatt, R. Cullen, R. Kwok, A. Schweiger, J. Zhang, C. Haas, S. Hendricks, R. Krishfield, N. Kurtz, S. Farrell and M. Davidson (2013), CryoSat-2 estimates of Arctic sea ice thickness and volume, Geophysical Research Letters, 40, doi:10.1002/grl.50193. A sample of 40-60 measurements per pixel indeed would imply a large uncertainty (SQRT(1/N)=2.5%). However, spread out over the hundreds or thousand pixels in the outer Arctic Basin, the confidence interval of the determination of ice thickness should be pretty tight (much less than 0.25%). Abstract. 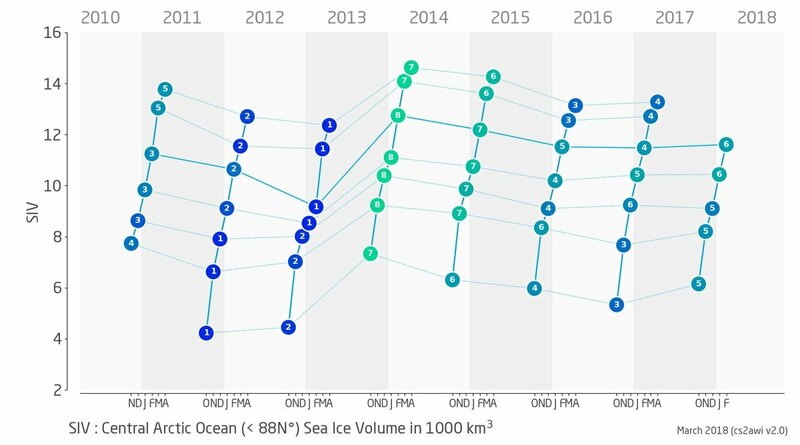 Over the past decade, sea-ice freeboard has been monitored with various satellite altimetric missions with the aim of producing long-term time series of ice thickness. While recent studies have demonstrated the capacity of the CryoSat-2 mission (2010–present) to provide accurate freeboard measurements, the current estimates obtained with the Envisat mission (2002–2012) still require some large improvements. In this study, we first estimate Envisat and CryoSat-2 radar freeboard by using the exact same processing algorithms. We then analyse the freeboard difference between the two estimates over the common winter periods (November 2010–April 2011 and November 2011–March 2012). The analysis of along-track data and gridded radar freeboard in conjunction with Envisat pulse-peakiness (PP) maps suggests that the discrepancy between the two sensors is related to the surface properties of sea-ice floes and to the use of a threshold retracker. Based on the relation between the Envisat pulse peakiness and the radar freeboard difference between Envisat and CryoSat-2, we produce a monthly CryoSat-2-like version of Envisat freeboard. The improved Envisat data set freeboard displays a similar spatial distribution to CryoSat-2 (RMSD  =  1.5 cm) during the two ice growth seasons and for all months of the period of study. The comparison of the altimetric data sets with in situ ice draught measurements during the common flight period shows that the improved Envisat data set (RMSE  =  12–28 cm) is as accurate as CryoSat-2 (RMSE  =  15–21 cm) and much more accurate than the uncorrected Envisat data set (RMSE  =  178–179 cm). The comparison of the improved Envisat radar freeboard data set is then extended to the rest of the Envisat mission to demonstrate the validity of PP correction from the calibration period. The good agreement between the improved Envisat data set and the in situ ice draught data set (RMSE  =  13–32 cm) demonstrates the potential of the PP correction to produce accurate freeboard estimates over the entire Envisat mission lifetime. Univ of Calgary study indicates that Cryosat-2 has overestimated Freeboard depth due to salinity/reflectivity of first-year sea ice. First year overestimate of volume up to 25% with total impact on basin (April Max) of 17% overestimated. 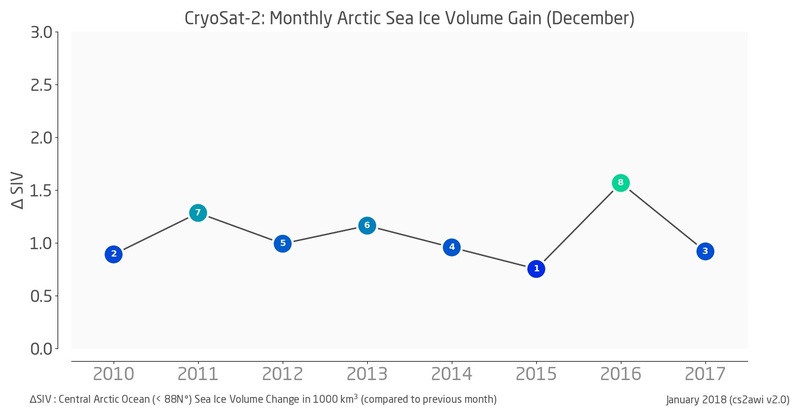 By providing unparalleled coverage of the Northern Hemisphere, data from ESA’s CryoSat-2 mission have allowed us to produce hemisphere-wide sea ice thickness and volume estimates since November 2010. The provision of sea ice thickness data from satellite is crucial in understanding how the ice pack as a whole is changing. Here we have provided an end-to-end, comprehensive description of the processing steps that we use at CPOM to obtain estimates of Arctic sea ice thickness and volume from CryoSat-2 data, along with a detailed analysis of the uncertainties associated with our retrieval and an evaluation of our sea ice thickness product. In theory, the method presented could be used to retrieve sea ice thicknesses in the Southern Hemisphere, and it provides the foundation to develop sea ice processing systems for other Polar orbiting satellite radar altimeters. Ideally, our uncertainty analysis would provide an error for each point measurement of sea ice thickness rather than grid cell values. This is currently hampered by a lack of knowledge regarding the correlation length scales and temporal variations of contributing factors such as snow depth and density, and sea ice density. 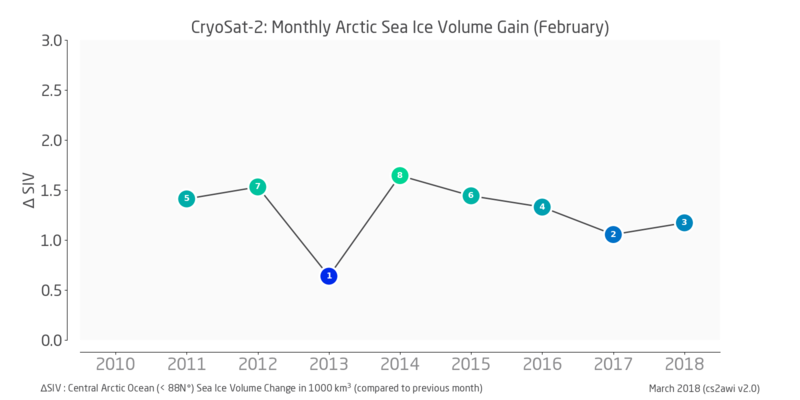 #CryoSat #SeaIce Feb 2018 thickness and volume update: Extent is at record low, but sea ice volume in Arctic Basin at levels of previous years (6th lowest / 3rd highest). Hendricks asks: "Above average Jan to Feb growth due to ice dynamics?" Either that, or, just like last year, snow. I'm even more curious to see the latest PIOMAS numbers. I guess that the satellite can mistakenly take snow over the sea ice. On Wrangel Island this year, a record layer of snow for the entire time of observation. PIOMAS says: "Below average Jan to Feb growth"
I'm discussing the latest instance of PIOMAS-CryoSat divergence in the PIOMAS March 2018 blog post. Actually Hendricks' graphs show that the growth in February was slightly below average. (The growth in January was above average, though). PIOMAS has January growth below average, 3005 vs 3195 km3. Maybe take a look inside that link? Ankle-deep snow over most of the Arctic sea ice, February 2018 average. Deeper over CAA multi-year ice but nowhere over your boots. What does it mean for Cryosat to measure monthly average ice thickness given that the icepack is in constant motion, with some regions moving much more rapidly than others? February saw displacements of a km per hour on some days. That is explored in the animation below; the 3rd frame is the Feb 2018 averaged Ascat and the 4th is its posterization. It seems Cryosat is unable to pull together the thick massive floe that originated along the CAA back in October which has now broken into numerous smaller floes making up the long deforming stringer from Banks Island into the northern Chukchi. It does somewhat recognize the MYI feature that formed back in early July 2017 that has lingered off the Laptev but misses the immense tongue that originated in the Kara in November. Ice thickness is difficult; ice provenance must be brought into the picture. A-Team your stuff with ASCAT is genius. It's like a new thickness measuring satellite. Interestingly, ASCAT sees "thick" ice just north of the New Siberian Islands, where PIOMAS claims there is a bunch of very thick ice but Cryosat does not. CyroSat-2 does not measure snow depth. Modified climatology is used instead. The climatology, based on Warren 1999, is modified to to allow for fact that snow thickness on FYI is approximately 50% of that on MYI.